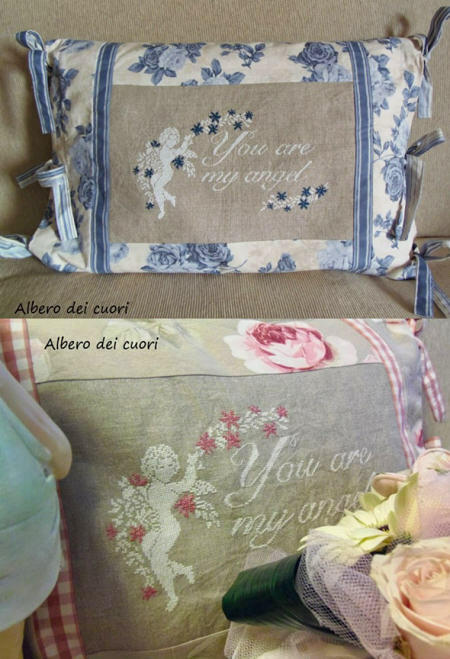 We have new designs that are enchanting... direct from Italy! Not much English instruction inside of these, the charts are beautifully presented in color... you could almost frame that teacup one!!!! I think they are all worked on Lambswool -- we have several different counts available -- with DMC floss. I think there are a few overdyeds, but then DMC blends are suggested. 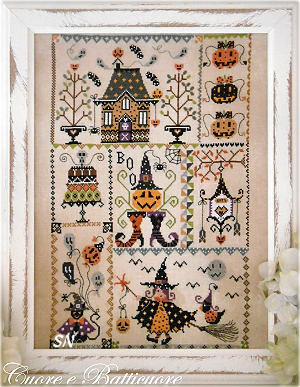 I love the teacup sampler -- just stitch one cup if you don't want to do them all! 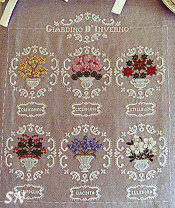 The floral vases and baskets come for all four seasons -- six designs in each chart. And, those ADORABLE little elf/gnomes steal the show! 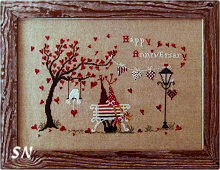 We have this Anniversary piece, a Valentine design and another that is a delightful Christmas Sled scene. All offered as charts, unique designs!! 14 x 22 on 32ct! 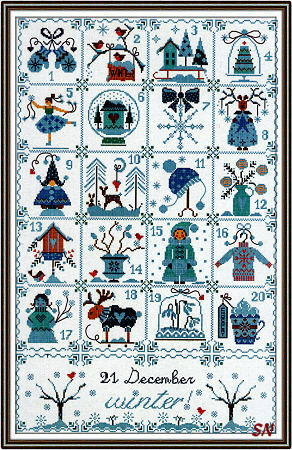 A delightful winter-y collection of 3 x 3-ish inch motifs, everything is stitched on frosty blues and soft browns. Think about adding some opalescent thread... and make small pin cushions for a basket instead of the whole sampler. Coded for DMC, presented as a chart. 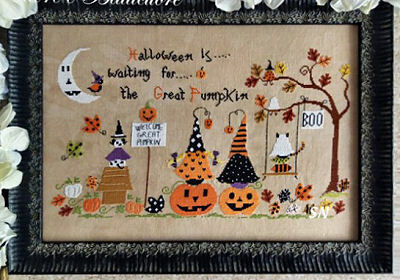 *Halloween is waiting for The Great Pumpkin! * I remember the Charlie Brown's friend Linus always spent Halloween Night waiting in the pumpkin patch for The Great Pumpkin to rise above... so here is a new group to carry on the tradition! I think Snoopy is sitting on top of the dog house and everything! Two little gnome friends perched on Jack-o-Lanterns... check out the little ghost-dressed kitty on the swing, too! 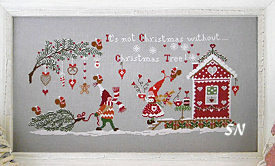 Measuring 279 x 160, this is stitched with just 13 shades of regular DMC floss. If you don't have time to do this entire piece... notice the tree on the right with that kitty and the tiny witch in the upper branches - it's a cute motif all by itself. Or, stitch just the best friends on the pumpkins - they're cute too. 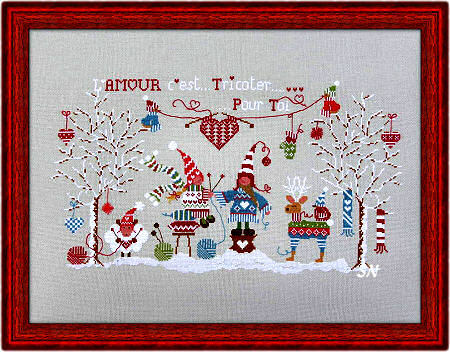 Well, I don't knit, but I GET how sweet, endearing and charming this piece is!!! Look at the little sheep down at the left -- knitting up a storm! Then, look at the giant yarn balls. Next... The little girl sitting on wool pillows knitting the sweater the other girl is WEARING! She's finishing a sleeve! Check out the reindeer looking on -- get a load of his sweater! And then... all the little birds everywhere with sweaters and knitted caps on! How can anyone who knits NOT love this??? 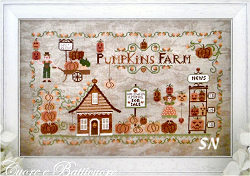 Presented as a chart, this measures 278 x 157 in stitch count -- a huge 18 x 10 on 32ct! It's coded for DMC... and just the cutest thing! Can't do the whole thing? Take out just that knitting sheep, or the reindeer! 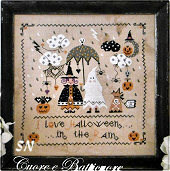 Here are two whimsical designs to celebrate Halloween! 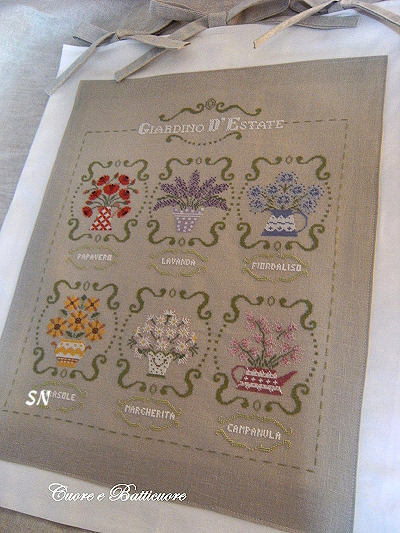 Presented in chart format, each is coded for DMC floss and can be stitched on just about any fabric you want! Halloween in Quilt -- Seven different small panels make up this charming medley -- there is a haunted layer cake, and a bouquet of ghost balloons, and lots of neat dividing borders, all stitched in oranges, black, greens and purple. 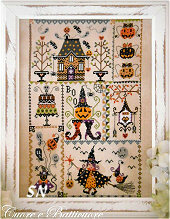 It finishes approx 12 x 15 on 32ct... but remember, each section can be stitched alone too! Halloween in the Rain -- Besides the cute umbrella in here, the little bat has heart wings, the moon is holding a jack-o-lantern, the clouds are polka dotted, and I think the Trick or Treat candy bag has the poison symbol on it! Finishes large at 12 inches square, you could leave off the words and the little border if you needed to. This is a fun design by Cuore d Batticuore -- an Italian company. A busy pumpkin farm, it's stitched on 32ct Vintage Country Mocha Belfast Linen with DMC flosses and finishes approx 15-1/2 x 9-1/2 in size. Cute little house, fun pumpkins and jack-o-lanterns everywhere, what I think are the most charming elements are the translations. *Pumpkins* is plural, and the big fat ones up at the top left are only 2 CENTS each!!! Presented in chart format -- very clear -- they offer colored charts, so this is supereasy to stitch from. Talk about a creative delivery process -- I'd rather have these dedicated reindeer taking care of me instead of the futuristic delivery drones we hear about in the news! Santa is up in the sky in his balloon-sleigh dropping deer and gifts everywhere!!! I love all the different patterns on the balloons and packages, but the sleepy street of elegant houses is missing all the excitement happening in the night sky! Stitch count on this is 179 x 238 -- it'll finish approx 11 x 15 on a 32ct. I can read 'Lambswool' in here for the fabric color, and DMC for the flosses. If you don't have time to stitch the whole thing, think about JUST the balloon-sleigh part! Welcome to our Mountain Home! This looks like a cabin straight from a German Cuckoo clock! 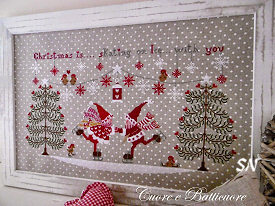 Beautiful garlands and evergreens, everything is snowy and festive for Christmas. The stitch count is 205 x 200 -- so it'll be 12-1/2 inches on 32ct Vintage Country Mocha Belfast Linen. 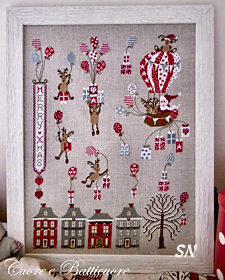 Do you see the tiny reindeer heads in the border? Kind of like the deer heads that might hang inside up high on the cabin wall??? *It's not Christmas without a Christmas Tree! * He's bringing home a tree, she's bringing him hot chocolate with LOVE! Check out the little squirrels on their hats, her apron strings and the tree! 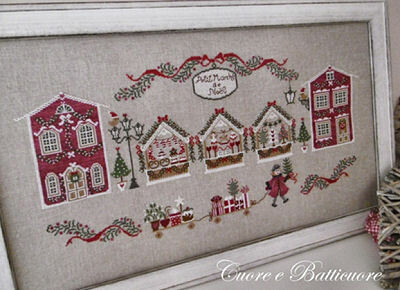 Absolutely enchanting, this measures 274 x 133 in stitch count -- approx 8-1/2 x 17 on 32ct! Coded for DMC floss, it's just the cutest thing! Chart format. *Christmas is skating with you. 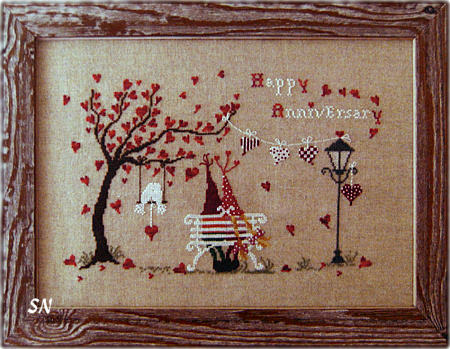 * We have several of these little 'Gnome' pics -- Valentines, Anniversary and the new Summertime scene-- they are so sweet. 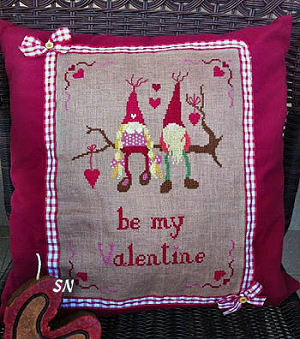 (actually, I am not sure these two ARE Gnomes... they could just be wearing stocking hats.) Our skating couple features red and white coordinating outfits... even their tiny bird friends have skates on!!!! 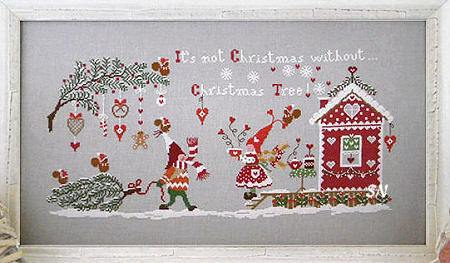 The evergreen trees are simple and lacy -- each branch is trimmed with a bitty red heart. 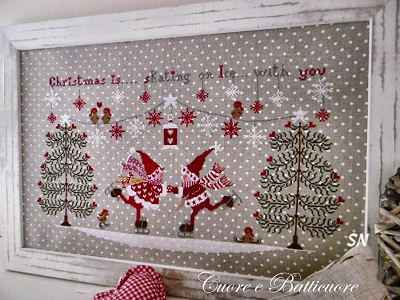 Stitched on the 32ct Natural Belfast Linen that features white polka dots printed on it, what a festive, snowflaky background those dots present! 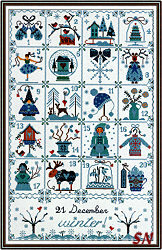 Stitch count for this is 259 x 152 -- finishing approx 16 x 9-1/2. Again -- just part of this would be charming -- just the couple? This is a Christmas Market scene. Silver Needle and Jeannette Douglas are sponsoring a Stitching Cruise down the Danube River this December -- we get to shop all those famous Markets in Nuremberg, Prague, Salzburg, Vienna and Budapest! So... this just gets us in the mood!!!!! Festive shop windows, the sign above that announces the Market scene (charted in three different languages) and that pretty wagon-train along the bottom, I think there are a lot of design elements in here that you could take out to stitch in a smaller format as well. Stitch count on the whole thing is 334 x 159, so on 32 Lambswool it will finish approx 21 x 10! This is a pretty set of small florals -- charted for pinks or lavenders -- that finishes into a scissor keeper, pin cushion, scissor fob and needle holder set. Everything is petite -- approx two and three inches in size -- and you can see how charming they all are by the collection in the picture. 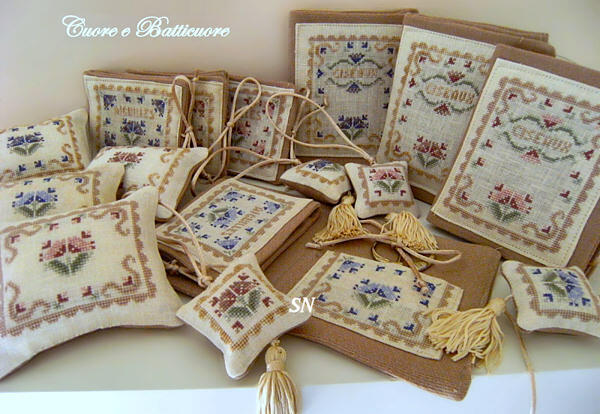 Italian and English instructions, I imagine you can use any number of assembly methods to make your set of smalls, as well as any color combinations. Offered as the chart for all the pieces. Don't you love this medley of floral teacups??? 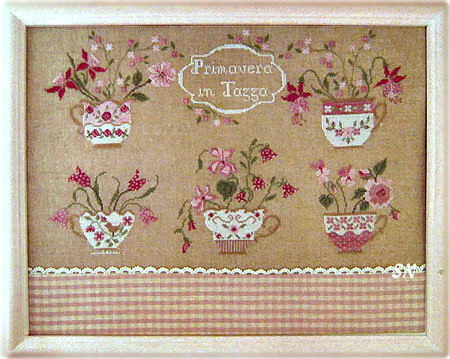 Each one is prettier than the last... all pinks, greens and whites, the entire piece measures 270 x 168, so they are actually generous in size. I love the framing feature as well... that border of fabric and lace at the bottom... just gives a delicate charm to the whole thing! 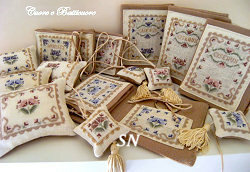 It'd make a lovely pillow on a bed -- natural or white linen, pastel colors... just simple but stunning! Anyway, the hearts everywhere are fun, and everyone smiles when they see this one! 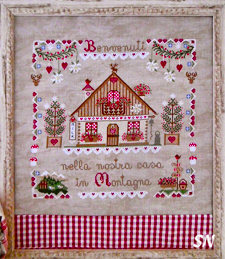 Stitch count is 198 x 125. 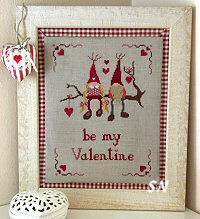 More cute Gnome charm... they are just sitting there on the tree branch -- Love is in the air! 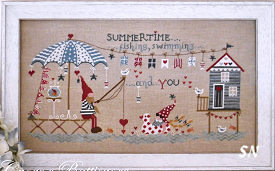 Stitch count of 106 x 148... you might have someone to stitch this for!!! 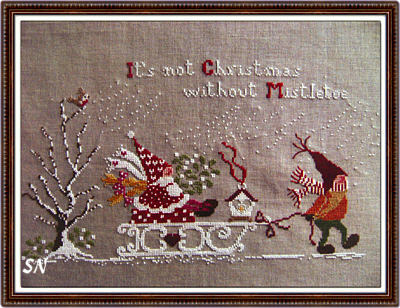 *It's Not Christmas Without Mistletoe! * Don't you love this little scene? 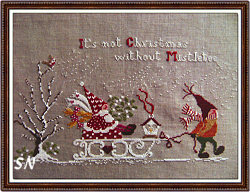 The cutest hats, fat feet, billowing scarves, the mistletoe and blowing snow... this has a stitch count of 214 x 129. I believe it's worked on Pearl Gray linen with 14 shades of DMC floss. Just enchanting! Wow... these are gorgeous!! 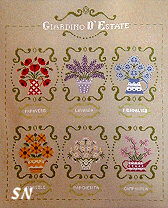 Each chart has 6 different pots, urns or vases of seasonal florals surrounded by a fillagreed border. The cover pics are very small, but opening the charts -- they are printed beautifully in color and can easily be stitched individually. 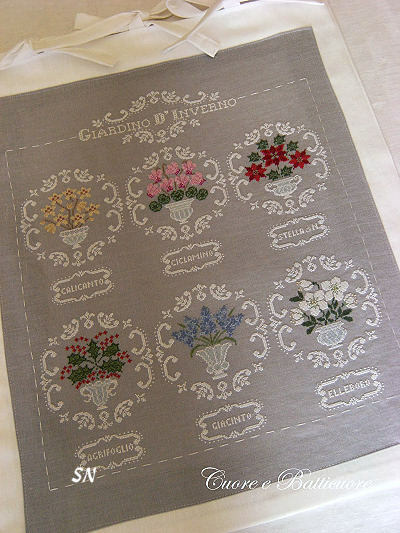 The actual florals run about 50 x 50 stitches each, without their borders and names. Charted for DMC, this is a lovely collection, you could split them up and make a whole bunch of pin cushions for one basket... or a long row to hang horizontally or vertically on a skinny wall... so pretty! Inverno is Winter and has two Christmas flowers -- Holly and Poinsettia. 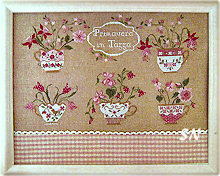 Primavera is Spring -- it has Tulips, Roses... names in both Italian and English. Autunno has pretty oak, maple and elder arrangements -- just beautiful!